← Broadswords and Blasters Issue 3 Is Live! 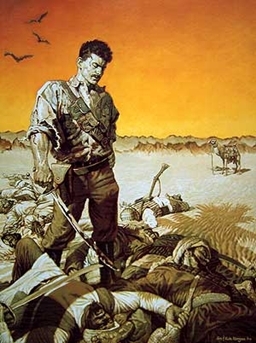 Another one of Robert E. Howard’s creations, Francis Xavier Gordon, better known as El Borak (Arabic for “The Swift”), is a Texan gunfighter and adventurer… only instead of his adventures taking place in the Old West, our hero finds himself in Afghanistan. For the most part, the El Borak tales are strict action-adventure. El Borak relies on his quick wits (and his quick hand with a gun or a blade) to get him out of the scrapes he finds himself in, typically against hostile tribesmen but also scheming politicians and rival adventurers. Gordon straddles a line between the barbarian and the civilized man, is not one to shy away from violence, but also with a keen understanding of how the Western world works… and why the West will always struggle in the hills of Afghanistan. However, unlike some of Howard’s other characters, Gordon is a man of vengeance, but possessed of a somewhat gentler soul. He stops to bind wounds. He cares for his men. He is a leader, unlike many of Howard’s other creations, who, though they might sit on thrones, only rarely do we get to see them lead men. One of the things that stuck out for me when reading is the level of detail Howard incorporated into his stories, and it reflected the amount of research he did into the setting as he was writing. Howard never travelled out of Texas, but he had enough resources at hand to craft a series of stories and to make the details surrounding the stories a key part of their attraction. So too, the setting functions as a frontier, but unlike the American West, a frontier and land with a history of never being conquered. Here a man fleeing civilization, fleeing the strictures of polite society, could remain always just out of reach. So my recommendation is that if you are looking for stories that are more adventure oriented, but without necessarily the sorcerous trappings of Conan or Kull, you could do a lot worse than tracking down EL BORAK. This entry was posted in Pulp Consumption and tagged Adventure Stories, Afghanistan, El Borak, Great Game, Middle East, Pulp, Robert E. Howard. Bookmark the permalink. This week’s Pulp Consumption… I talk about El Borak, a lesser known Robert Howard character, but definitely one that deserves more attention. Qubible re “Howard never travelled out of Texas,” — as his Wikipedia entry notes, at 13 he did spend a little time in New Orleans. Fair enough, but the point stands that he wasn’t exactly what one would call a world traveler, and definitely not to Afghanistan.